Coastal communities and state governments recognize the importance of understanding and planning for climate impacts. 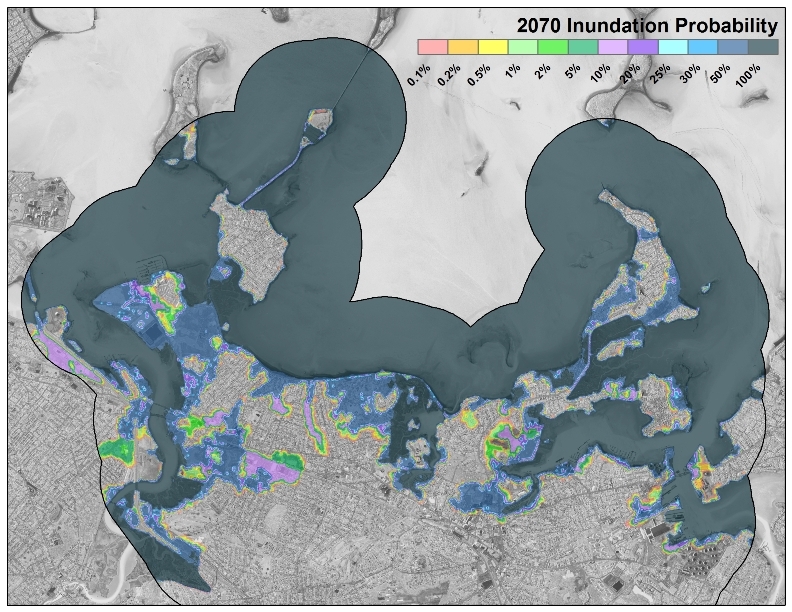 Coastal Engineers at Woods Hole Group have been at the forefront of developing and applying models of sea level rise and storm surge to equip coastal communities with the tools needed to evaluate inundation probabilities and asset vulnerabilities, and to prepare and prioritize responses. Independently, Woods Hole Group Ecological Risk Assessors apply and continue to refine methodologies for evaluating risk to aquatic and terrestrial wildlife from chemicals, invasive species and habitat loss. In addition, Environmental Scientists are developing plans to assist developers and businesses benchmark, monitor and reduce environmental impacts (greenhouse gases, water, solid waste) through sustainability planning. Sea level rise and storm inundation models, ecological risk assessment and sustainability planning are all central to a comprehensive climate change adaptation and mitigation program. We are exploring climate change impacts beyond infrastructure vulnerability, including impacts on ecological systems (e.g., wetlands, rare species) and natural resource recreation and future land uses. In this newsletter, we provide background on the various types of property vulnerabilities from climate change, the tools available for vulnerability assessment, and the value of a comprehensive approach to vulnerability assessment, adaptation and sustainability planning. Concern about climate vulnerability has grown as models capable of forecasting sea level rise and storm inundation probabilities improve. Central to the response is a risk-based prioritization of infrastructure adaptations and engineered coastal protections. As managers consider the implications of different scenarios and the range of uncertainty in predicted impacts, there is a need to extend vulnerability assessments to include other assets. Functioning and healthy ecosystems, recreational opportunities, access, economic growth, and human health are all vulnerable to sea level changes. Sustainability, in a sense, brings the vulnerability assessment full circle – the risks are estimated, adaptations are implemented and sustainability plans are designed to mitigate future impacts of climate. Climate change presents diverse challenges to communities. Through its threats to roads, public buildings, homes, recreational activities, wetlands or other natural areas, climate change – and our response – will reshape coastlines. The combination of scenario-based probabilistic storm and sea level rise modeling, evidence-based asset valuation, relative risk assessment1 and adaptation, all offer the opportunity to plan for and reduce contributions to future climate change. Figure 1 summarizes the components and connections in the framework. •	The addition of risk assessment approaches increases the range of vulnerabilities that can be assessed, including natural systems, endangered species, and recreational activities. •	The relative risk model framework clarifies how asset vulnerability can be assessed, and how a management program can be targeted to maximize asset protection. •	The causal analysis framework provides an objective approach to assigning value to different assets. This is particularly useful when there are diverse and conflicting interests. •	Sustainability plans provide a road map for towns and businesses to meet regulatory requirements, reduce carbon footprints and link actions with climate vulnerability reductions. Determining the probability that an impact will occur and the consequence of that impact requires comparative tools. Tools applied to a multi-disciplinary vulnerability assessment include sea-level rise/storm surge models, comparative vulnerability and consequence frameworks and adaptation plans. Each is introduced briefly in this Section. 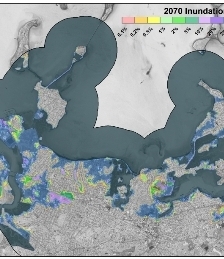 Traditionally, bathtub type modeling has been applied to understand how rising sea levels will influence coastal areas. These results often represent worst-case scenarios for which communities struggle to comprehend and prepare. The value of these models also is limited because they do not capture the time- and space-varying influence of storms under different climate change scenarios. In contrast, our tightly-coupled wave and current hydrodynamic model provides users with the ability to visualize a range of storm and sea level rise scenarios through a probabilistic lens. A sophisticated statewide dynamic sea level rise and storm surge model provides site-specific information including flooding pathways, probabilities of inundation, water depths and water residence times2. In addition, the Sea-Level Affecting Marshes Model (SLAMM) provides site-specific information about vulnerable coastal wetlands and potential future wetland migration and wetland type conversion due to future sea level rise3. Together, these models provide insights into what coastal assets could be affected by rising seas. Well-established assessment and management tools are readily adaptable from the field of ecological risk assessment. Specifically, relative risk modeling provides a framework to prioritize and rank vulnerabilities based on the preferences of stakeholders most familiar with the assets. Ecological risk assessment provides methods to evaluate exposures to stressors and the resulting effects. The causal analysis framework provides a transparent and defensible approach for determining if a given scenario is likely to result in a specific outcome. Each framework is described briefly below. The RRM is well suited for evaluating how different climate scenarios might impact ecological systems. This approach was most clearly described by Landis et al. (2004a, b) and an example application is provided in Menzie et al. (2013). Risk can be uncertain and calculating an absolute risk when the potential effects are diverse is particularly difficult. 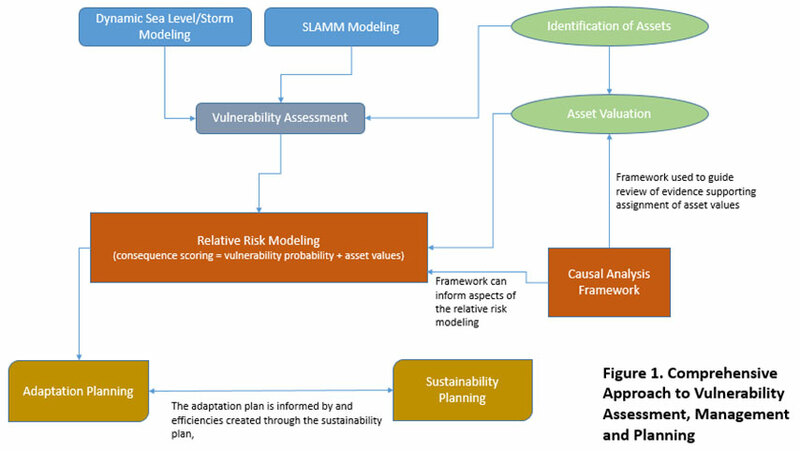 The RRM provides a systematic approach for identifying the effects of climate scenarios (using measures of effects specific to each asset), evaluating the comparative magnitude and impact (in this case over time) by vulnerability, ranking the vulnerabilities by asset and consequence, and then identifying where management actions would have the greatest impact. The RRM can be used to join the probability of specific scenarios with the consequence of those scenarios. In addition to identifying and ranking vulnerabilities by asset, and consequence of scenarios, there are cases in which the owner or manager of an asset need to analyze evidence regarding a specific risk to develop a defensible management strategy. The causal analysis framework provides a transparent, objective and technically sound methodology to identify quality lines of evidence (Wickwire and Menzie, 2010). For example, when a diverse group works on assigning values to different assets it can be beneficial to apply an objective and transparent approach to evaluating the evidence supporting specific values. The causal assessment framework encourages the team to focus on measurable lines of evidence rather than personal opinion. Example of installed rip-rap and coir fiber roll. After the probable impacts have been modeled and the scenario-based vulnerabilities have been ranked, asset managers develop adaptation strategies to minimize risk to assets and develop mitigation strategies to minimize the environmental impact of the proposed adaptation. 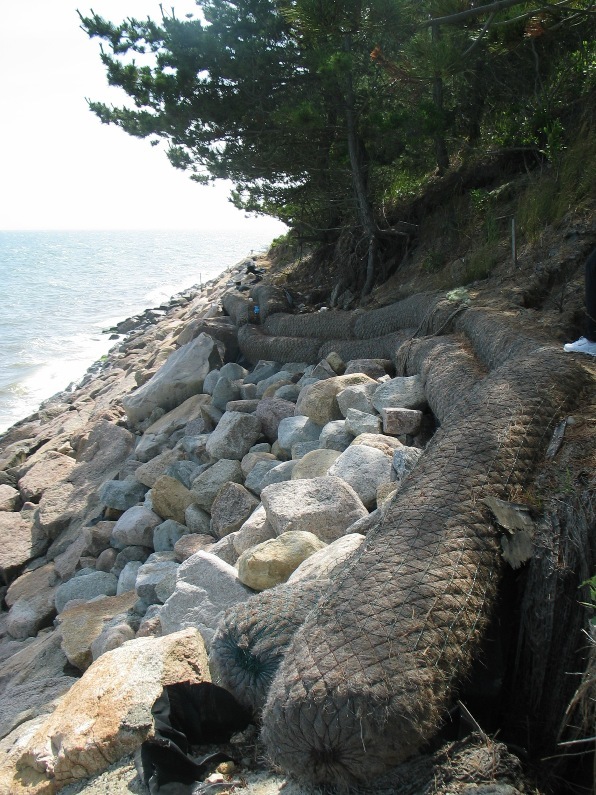 In the adaptation step, Coastal Engineers and asset managers (e.g., town planners) develop robust and site-sensitive protections that leverage gray (modular sea walls, breakwaters, etc. ), green (beach nourishment, dune reconstruction, wetlands/reef restoration) or hybrid infrastructure. In this phase, there is an opportunity to integrate sustainability into the planning process. Sustainability planning seeks not only to address climate change impacts (adaptation), but also to proactively reduce the environmental footprint of an activity (mitigation). Sustainability plans consider the impact of different energy usage and production scenarios, calculate carbon footprints for alternative activities, track resource allocation (such as water use, solid waste generation and recycling/disposal) and apply green design principles to new infrastructure and updates to existing facilities. A well-developed adaptation and sustainability plan increases asset and community resilience, compares the efficiencies of different management solutions, saves the client money in the long-term, and minimizes contributions to future climate change. With all of the tools available, climate vulnerability assessment and planning provides coastal communities and businesses with the opportunity to prepare for changing threats and adapt to a new future. 1Relative risk assessment is applied at the asset level to combine vulnerability modeling with valuation to arrive at a consequence of the asset loss. 2This model is currently used by the Woods Hole Group Team in partnership with Massachusetts Department of Transportation. 3The Woods Hole Group Team runs this model for Massachusetts Coastal Zone Management.